Myxogastria/Myxogastrea (myxogastrids, ICZN) or Myxomycetes (ICBN), is a class of slime molds that contains 5 orders, 14 families, 62 genera and 888 species. They are colloquially known as the plasmodial or acellular slime moulds. All species pass through several, very different morphologic phases, such as microscopic individual cells, slimy amorphous organisms visible with the naked eye and conspicuously shaped fruit bodies. Although they are monocellular, they can reach immense widths and weights: in extreme cases they can be up to 1 metre (3 ft 3 in) across and weigh up to 20 kilograms (44 lb). The class Myxogastria is distributed worldwide, but it is more common in temperate regions where it has a higher biodiversity than in polar regions, the subtropics or tropics. They are mainly found in open forests, but also in extreme regions such as deserts, under snow blankets or underwater. They also occur on the bark of trees, sometimes high in the canopy. These are known as corticolous myxomycetes. Most species are very small. The Latin name Myxomycota comes from the Ancient Greek words μύξα myxa, which means "mucus", and μύκης mykes, which means "fungus". The name Myxogastria was introduced in 1970 by Lindsay Shepherd Olive to describe the family Myxogastridae, which was introduced in 1899 by Thomas Huston Macbride. Swedish mycologist Elias Magnus Fries described numerous slime moulds as Myxogasteres in 1829. Species in the class Myxomycota are colloquially known as plasmodial or acellular slime moulds. Some consider the Myxomycota to be a separate kingdom, with an unsettled phylogeny because of conflicting molecular and developmental data. The relations among Myxogastrid orders are as yet unclear. The continuous classification of new taxa reveals that the class is not fully described. The class comprises around 900 to 1000 species. According to a 2000 inquiry, there were 1012 officially accepted taxa, including 866 on species level. Another study in 2007 stated a number of more than 1000, in which the Myxogastria comprised the biggest group of slime moulds, with over 900 species. On the basis of sequenced environmental samples it is estimated that the group has between 1200 and 1500 species, more than previously estimated. Among the 1012 taxa only a few species are common: 305 were discovered in a single location or groupings, a further 258 species were found in a few areas between two and 20 times, and only 446 were common in several locations with over 20 discoveries. Reclassifications encounter problems because the Myxogastriae are morphologically very plastic, which is to say susceptible to environmental influences; only a few characteristics are diagnostic for a small number of species. In the past authors have unsuccessfully tried to describe a new taxon based on a small number of examples, but this leads to numerous duplications, sometimes even at genus level. For example, Squamuloderma nullifila is actually a species from the genus Didymium. This is a traditional classification based on Lister and Lister, made in the early 20th century. Molecular genetical studies confirm and stabilise this classification. The most basal group is Echinosteliida. Other groups further contain two superclades, which are morphologically definable by spore colour. The following classification is based on Adl et al. 2005, while the classes and further divisions on Dykstra and Keller 2000, who included the Myxogastria in Mycetozoa. The sister taxon is the subclass Dictyostelia. Together with the Protostelia they formed the taxon of the Eumycetozoae. Other subclasses differ from the other species mainly in the development of fruit bodies; while Protostelia create a separate fruit body from each single mononuclear cell, Dictyostelia develop cell complexes – the so-called pseudo-plasmodia – from separate cells, which then become fruit bodies. Some classifications place part of the orders above in the subclass Myxogastromycetidae. The spores of Myxogastria are haploid, mainly round and measure between 5 µm and 20 µm, rarely up to 24 µm in diameter. Their surface is generally reticular, sharp, warty or spiky and very rarely smooth. The typical colour of the spore mass becomes visible through the structure, since the spores themselves are not pigmented. In some species, especially of the genus Badhamia, the spores produce lumps. The colour, shape and diameter of spores are important characteristics for identifying species. Important factors for the germination of spores are mainly moisture and temperature. The spores usually remain germinable after several years; there were even spores preserved in herbarium specimens which germinated after 75 years. After the spores' development, they first receive a diploid nucleus, and the meiosis takes place in the spore. At the germination, the spore shells open either alongside special germinal pores or chinks, or rip irregularly and then release one to four haploid protoplasts. In those species which reproduce sexually, haploid cells bud from the spores. Depending on the environmental conditions, either a myxamoeba or a myxoflagellate buds from the spore. Myxamoebae move like amoebae – that is, crawling on the substrate – and are produced in dry conditions. Myxoflagellates, which are peritrichous and can swim, develop in moist to wet environments. Myxoflagellates almost always have two flagella; one is generally shorter than the other and sometimes only vestigial. The flagella are used for locomotion and to help to move food particles closer. If the humidity changes, cells can switch between the two manifestations. Neither form has a cell wall. This developmental stage (and the next one) serves as a nourishment provider and is also known as the first trophic phase (nourishment phase). In this monocellular phase, the Myxogastria consume bacteria and fungus spores, and probably dissolved substances, and they reproduce through simple cell division. If the environmental conditions change adversely in this phase, for example extreme temperature, extreme dryness or food shortage, the Myxogastria may switch to very long-lived, thin-shelled quiescent states – the so-called microcysts. For that to happen, the myxamoebae assume a round shape and secrete a thin cell wall. In this state they can easily survive one year or longer. If living conditions improve, they become active again. If two cells of the same type meet in this phase, they cross-fertilise to a diploid zygote through the fusion of protoplasms and nuclei. The conditions which trigger this are not known. The diploid zygote becomes a multinucleated plasmodium through multiple nuclear divisions without further cell division. If the resulting cells were peritrichous, they change their shape before the fusion from the peritrichous form to the myxamoeba. For the production of a zygote, cells of different mating types (heterothallic) are required. The second trophic phase begins with the development of the plasmodium. The multinucleated organism now absorbs via phagocytosis as many nutrients as possible. These are bacteria, protists, dissolved substances, moulds, higher fungi and small particles of organic material. This enables the cell to undergo enormous growth. The nucleus divides multiple times, and the cell soon becomes visible to the naked eye and usually has a surface area – depending on the species – up to one square metre; however, in 1987 one artificially cultivated cell of Physarum polycephalum attained a surface area of 5.5 sq m. Myxogastria species have numerous nuclei in their trophic plasmodium phase; the small, non-veined proto-plasmodia have between 8 and 100 nuclei, while large, veined meshworks have between 100 and 10 million nuclei. All of these remain part of a single cell, which has a viscous, slimy consistency and may be transparent, white or brightly coloured in orange, yellow or pink. The cell has chemotactic and negative phototactic capabilities in this phase, meaning that it is able to move towards nutrients and away from dangerous substances and light. The movements originate in the grainy cytoplasm, which streams by pulsation in one direction within the cell. In this way the cell reaches a speed of up to 1000 µm per second – the speed in plant cells is 2 to 78 µm per second. A resting state, the so-called sclerotium, may occur in this phase. The sclerotium is a hardened, resistant form composed of numerous "macrocysts", which enable the myxogastria to survive in adverse conditions, for example during winter or dry periods, in this phase. Mature plasmodia can produce fruit bodies under appropriate circumstances, the exact triggers for this process are unknown. According to laboratory researchers, changes in humidity, temperature or pH value as well as starvation periods were thought to be the triggers in some species. The plasmodia abandon their nutrient intake and crawl, attracted by light – a positive phototaxis – towards a dry, light area, to get an optimal spread of the spores. Once the fructification begins, it can not be stopped. If disturbances occur, malformed spore-bearing fruit bodies are often produced. The plasmodium or parts of the fruit bodies can be smaller than one millimetre, in extreme cases they are up to a square metre and weigh up to 20 kilograms (44 lb) (Brefeldia maxima). Their shape is often pediculated or unstiped sporangia with non-cellular stems, but can also appear as veined ar netted plasmodiocarps, pincushion-shaped aethaliae or seemingly pincushion-shaped pseudo-aethaliae. The fruit bodies almost always have a hypothallus on the edge. The abundantly produced spores are stored in a reticular or filamentous structure – the so-called capillitium – and are found on nearly all species except Liceida and other species from the genus Echinostelium. When the open fruit bodies have dried, the spores are dispersed by wind or by small animals such as woodlice, mites or beetles, which either pick up the spores through contact with the fruit bodies or ingest and then excrete them. Dispersal by running water is also possible, but it plays a minor role. Some Myxogastria species may produce asexually. These are continuously diploid. There is no meiosis before the germination of the spores and the production of the plasmodium proceeds without germination of two cells. Myxogastria are distributed worldwide; species were found by early researchers on all continents. However, as many parts of the world were yet not discovered or explored, the exact distribution is not fully known. Europe and North America are often considered the basic habitat of the Myxogastria species. According to recent research, the majority of species are not widely distributed. The Myxogastria are most commonly found in temperate latitudes, and rarely in the polar regions, the subtropics or tropics. The physical features of the substrate and climatic conditions are the major aspects of the species' presence. Endemism is rare. In the northern areas, the species can be found in Alaska, Iceland, northern Scandinavia, Greenland and Russia. These are not only particular, specialised species; according to an overview study, more than 150 species were found in the arctic and subarctic regions of Iceland, Greenland, northern Russia and Alaska. These distinctly exceed the tree line. In Greenland, the habitat may reach the 77th latitude line. The Myxogastria species reach their largest biodiversity and highest frequency in forests of temperate regions, which are ideal habitats because of the amount of rich organic material, suitable humidity (not too high) and long-lasting snow cover for snow-inhabiting species. Few Myxogastria species are found in the tropics and subtropics, mainly because of the high humidity which prevents the necessary dehydration of the fruit bodies to permit spore dispersal and promotes infestation by moulds. Other factors are low light levels under the forest canopy which reduces phototaxis, light winds, poor soils, natural enemies and heavy rainfall which can wash away or destroy cells. Species living in soil or deadwood decrease as humidity increases. In a study from Costa Rica, 73% of the total findings were in the relatively dry Tropical Moist Forest, while 18% were in the very moist Tropical Premontane Wet Forests and only 9% in Lower Premontane Rain Forest. In the Antarctic, species were found in the South Shetland Islands, South Orkney Islands, South Georgia and the Antarctic Peninsula. Species from the Antarctic or subantarctic regions are rarer than specimens in the Arctic regions, although lack of access may be a factor. Until 1983, only five records were made, with only individual finds since then. 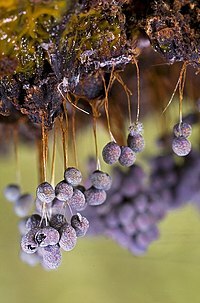 According to two studies of the myxomycete flora of these regions, more species were discovered in the subantarctic forests, for example 67 species in Argentinian Patagonia and Tierra del Fuego, and 22 on high ground on Macquarie Island. The majority of Myxogastria species live terrestrially in open forests. The most important microhabitat is deadwood, but also the bark of living trees (corticolous myxomycetes), rotting plant material, soil and animal excrements. Slime moulds may be found in numerous unusual locations. The comprehensive group of the nivicol Myxogastria populate closed snow blankets, to quickly fructificate at exposure – for example during thaws – and release their spores. Other habitats are deserts – 33 species were found in the Sonora desert, for example – or living on leaves from plants in the tropics. Some species live in aquatic environments, such as those of the genera Didymium, Physarum, Perichaena, Fuligo, Comatricha and Licea, which were found living underwater as myxoflagelletes and plasmodia. All but one species, Didymium difforme, fructificated only when the water ebbed or when they left it. The relationships of the Myxogastria to other creatures have not been thoroughly researched as of 2012. Their natural predators include many arthropods, including mites and springtails, and especially beetles such as the rove beetles, round fungus beetles, wrinkled bark beetles, Eucinetidae, Clambidae, Eucnemidae (false click beetles), Sphindidae, Cerylonidae, and minute brown scavenger beetles. Various Nematodes have also been observed to be their predators; they attach their posterior portion on the cytosol of the plasmodia or even live within the strands. Certain Diptera species have evolved to specialise in this way: these are mostly representatives of the Mycetophilidae, Sciaridae and Drosophilidae. The species Epicypta testata was especially frequently found, especially on Enteridium lycoperdon, Enteridium splendens, Lycogala epidendrum and Tubifera ferruginosa. Some true fungi specialise in the colonisation of the Myxogastriae: almost all of these are species of sac fungi. The most common such fungus is Verticillium rexianum – mainly species from Comatricha or Stemonitis. Gliocladium album and Sesquicillium microsporum are often found on Physaridae, while Polycephalomyces tomentosus is often found on certain species of Trichiidae. Nectriopsis violacea specialises on Fuligo septica. Bacterial associates, mainly from the family Enterobacteriaceae, were discovered on plasmodia. The combination of plasmodia and bacteria can bind atmospheric nitrogen or produce enzymes which make possible the decomposition of e.g. lignin, carboxymethylcellulose or xylan. In a few cases, the plasmodia acquired salt tolerance or tolerance of heavy metals through this association. Some myxomycetes (Physarum) cause disease in plants such turfgrasses, but no control is usually necessary against them. Fossil records of Myxogastria are extremely rare. Due to their short lifespan and the fragile structures of the plasmodia and the fruit body, fossilisation and similar processes are not possible. Only their spores can be mineralised. The few known examples of fossilised living states are preserved in amber. Up to 2010, three fruit bodies, two spores and one plasmodium have been described. Two older taxa – Charles Eugène Bertrand's Myxomycetes mangini and Bretonia hardingheni from 1892 – are now considered dubious and are today often disregarded. Friedrich Walter Domke described in 1952 a 35 to 40 million year old find in Baltic amber of Stemonitis splendens, an extant species. The state and completeness of the fruit bodies are remarkable, enabling accurate determination. From the same period, location and material is an Arcyria sulcata, first described in 2003 by Heinrich Dörfelt and Alexander Schmidt, a species very similar to today's Arcyria denudata. Both discoveries imply that the fruit bodies of the Myxogastria have changed only slightly in the last 35 to 40 million years. However, the Protophysarum balticum from Baltic amber, first described by Dörfelt and Schmidt in 2006, is considered questionable. The fossil was inconsistent with the typical characteristics of the genus and it was not a valid publication because no Latin name was identified with it. Also, important details of its fruit bodies were not visible or contradicted the identification. Today it is assumed that the fossil belongs to a lichen similar to the genus Chaenotheca. The only known discovery of a preserved plasmodium was found in amber in the Dominican Republic, and was then grouped into the Physarida. However, this claim is also considered doubtful as the publication was later classified as insufficient due to lack of evidence. The only known mineralised fossils are the two spore findings from 1971, one of which, Trichia favoginea, is assumed to be from the postglacial period. In palynologian researches, by absorbing Myxogastria spores, the fossil was not recognised. Because of their unprepossessing nature, the Myxogastriae were for a long time not well researched. Thomas Panckow first named the mould Lycogala epidendrum as "Fungus cito crescentes" in his 1654 book Herbarium Portatile, oder behendes Kräuter- und Gewächsbuch. In 1729, Pier Antonio Micheli thought that fungi are different from moulds, and Heinrich Friedrich Link agreed with this theory in 1833. Elias Magnus Fries documented the plasmodial stage in 1829, and 35 years later Anton de Bary observed the germination of the spores. De Bary also discovered the cyclosis in the cell for the movement, he saw them as animal-like creatures and reclassified them as Mycetozoa, which literally translates "Fungus animals". This theory dominated until the second half of the 20th century. From 1874 to 1876, Jósef Tomasz Rostafinski, a student of Anton de Bary, published the first extensive monography of the group. Three monographs by Arthur Lister and Guilielma Lister were published in 1894, 1911 and 1925. These were groundbreaking works about the Myxogastria, as was the 1934 book The Myxomycetes by Thomas H. Macbride and George Willard Martin. Important works in the late 20th century were the 1969 monographs by George Willard Martin and Constantine John Alexopoulos, and the 1975 monograph by Lindsay Shepherd Olive. The first is perhaps the most notable, as with it "the modern era of the taxonomy of the Myxogastria began". Other notable researchers were Persoon, Rostafinski, Lister, Macbridge, and Martin and Alexopoulos, who discovered and classified many species. ^ Baldauf SL, Doolittle WF (October 1997). "Origin and evolution of the slime molds (Mycetozoa)". Proc. Natl. Acad. Sci. U.S.A. 94 (22): 12007–12. doi:10.1073/pnas.94.22.12007. PMC 23686. PMID 9342353. ^ Kirk PM, Cannon PF, Minter DW, Stalpers JA (2008). Dictionary of the Fungi (10th ed.). Wallingford: CABI. p. 765. ISBN 978-0-85199-826-8. ^ a b Ing, Bruce (1999). The myxomycetes of Britain and Ireland : an identification handbook. Slough, England: Richmond Pub. Co. p. 4. ISBN 978-0855462512. ^ Anne-Marie FD, Cedric B, Jan P, Baldauf Sandra L (2005). "Higher-order phylogeny of plasmodial slime molds (myxogastria) based on elongation factor 1-A and small subunit rRNA gene sequences". The Journal of Eukaryotic Microbiology. 52 (3): 201–210. doi:10.1111/j.1550-7408.2005.00032.x. PMID 15926995. ^ Adl SM, Leander BS, Simpson AG, Archibald JM, Anderson OR, Bass D, Bowser SS, Brugerolle G, Farmer MA, Karpov S, Kolisko M, Lane CE, Lodge DJ, Mann DG, Meisterfeld R, Mendoza L, Moestrup Ø, Mozley-Standridge SE, Smirnov AV, Spiegel F (2007). "Diversity, Nomenclature, and Taxonomy of Protists". Systematic Biology. 56 (4): 684–689. doi:10.1080/10635150701494127. PMID 17661235. ^ H. Raven; Ray F. Evert & Helena Curtis (1988). Biologie der Pflanzen (in German) (2nd ed.). Walter de Gruyter GmbH. pp. 267–269. ISBN 978-3-11-011476-8. ^ de Basanta DW, Lado C, Estrada-Torres A, Stephenson SL (2010). "Biodiversity of myxomycetes in subantarctic forests of Patagonia and Tierra del Fuego, Argentina". Nova Hedwigia. 90 (1–2): 45–79. doi:10.1127/0029-5035/2010/0090-0045. ^ Lindley LA, Stephenson SL, Spiegel FW (2007). "Protostelids and myxomycetes isolated from aquatic habitats". Mycologia. 99 (4): 504–509. doi:10.3852/mycologia.99.4.504. ^ Agrios, George N. (2005). Plant Pathology. 5th ed. Academic Press. link. This page was last edited on 7 March 2019, at 04:36 (UTC).